It's Friday, March 15, 2019. Let's start here. The president of the United States of America responded with a one-word tweet after 12 Republicans joined 47 Democrats in voting to reject the national emergency declaration Donald Trump announced because he wants to build a wall. 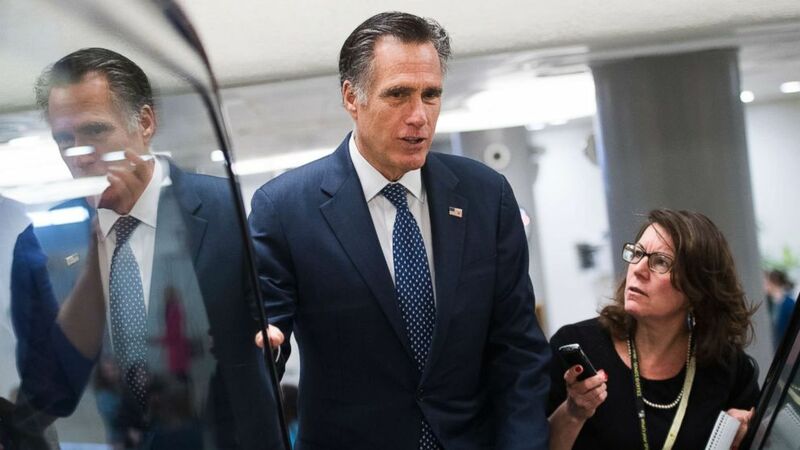 "This is a constitutional issue," Sen. Mitt Romney, R-Utah, told reporters on Thursday, "and I'm going to honor my oath of office." Romney had said before the vote he'd oppose Trump. Mary Bruce, ABC News senior congressional correspondent, tells "Start Here" that although the vote "isn't likely to change anything" practically, it's a different story politically. Francesco "Franky Boy" Cali, who allegedly ran the Gambino crime family, was gunned down Wednesday night in front of his home in New York City -- "a true hit," experts say. It was "a classic assassination of a mob boss," says former New York Police Department Detective Robert Boyce. So that happened. Except it didn't. ABC News Senior Foreign Correspondent Ian Pannell joins the podcast today with the latest on Brexit. Perhaps the worst part -- and there are many bad parts -- of the $25 million college admissions scandal is that many of those who cheated on exams -- or facilitated cheating on exams -- exploited accommodations for students with learning disabilities, and now fewer of those students' requests may be taken seriously. "There's going to be a lot more students who don't ever get these accommodations that they need," Lia Beatty, an advocate for students with disabilities, says today on "Start Here." Three suspects, at least one of whom has been charged with murder, are in custody after a shooting spree at two mosques in New Zealand killed 49 people. Police said one gunman, dressed in tactical gear, appeared to be livestreaming the terror attack on social media. "This," Prime Minister Jacinda Arden said at a Friday press conference, "is one of New Zealand's darkest days." Even after 31 trillion digits, we're still no closer to the end of pi: On Thursday, Google announced that one of its employees, Emma Haruka Iwao, had found nearly 9 trillion new digits of pi, setting a new record. Humans have now calculated the never-ending number to 31,415,926,535,897 (get it?) -- about 31.4 trillion -- decimal places. The story of Elizabeth Holmes and her technology company Theranos is an unbelievable tale of ambition and fame gone terribly wrong. How did the world's youngest self-made female billionaire lose it all in the blink of an eye? How did the woman once heralded as "the next Steve Jobs" find herself facing criminal charges -- she's pleaded not guilty -- and up to 20 years in jail? How did her technology, meant to revolutionize healthcare, potentially put millions of patients at risk? How did so many smart people get it so wrong for so long? You've listened to the runaway hit podcast, "The Dropout." Watch the two-hour "20/20" special tonight, at 9 eastern, 8 central, on ABC. "Start Here" is the flagship daily news podcast from ABC News -- a straightforward look at the day's top stories in 20 minutes. Listen for free every weekday on Apple Podcasts, Google Podcasts, iHeartRadio, Spotify, Stitcher, TuneIn or the ABC News app. On Amazon Echo, ask Alexa to "Play 'Start Here'" or add the "Start Here" skill to your Flash Briefing. Follow @StartHereABC on Twitter, Facebook and Instagram for exclusive content, show updates and more.